PRESIDENT RECEP Tayyip Erdogan has promised and vowed that millions of Syrians living in Turkey will return home as his country is committed to fighting terrorism. Erdogan was speaking during an election rally in the city of Gaziantep, located near Turkey’s border with Syria on Sunday. Erdogan refers to the 3,460-square-kilometre area in the de facto rule of Turkey in the northwest of Syria, as a result of two cross-border military offensives carried out in the region by the Turkish Army since mid-2016. He said after Syria’s Manbij, Tal Rifaat and the region east of the Euphrates is cleared from the YPG, millions of Syrians living in Turkey will be relocated to the area. The People’s Protection Units, YPG is a Kurdish militant group fighting against the Islamic State in the region along with Coalition Forces. Turkey deems the YPG as a terrorist group and as an extension of the Kurdistan Workers’ Party (PKK), which has waged an armed insurrection in Turkey for decades. Gaziantep, the city where Erdogan spoke, hosts more than 400 000 Syrians, nearly fifth of its population. Some analysts said as elections loom, Erdogan’s promise to send back Syrians might be addressing the growing unease at his base with his immigration policies. 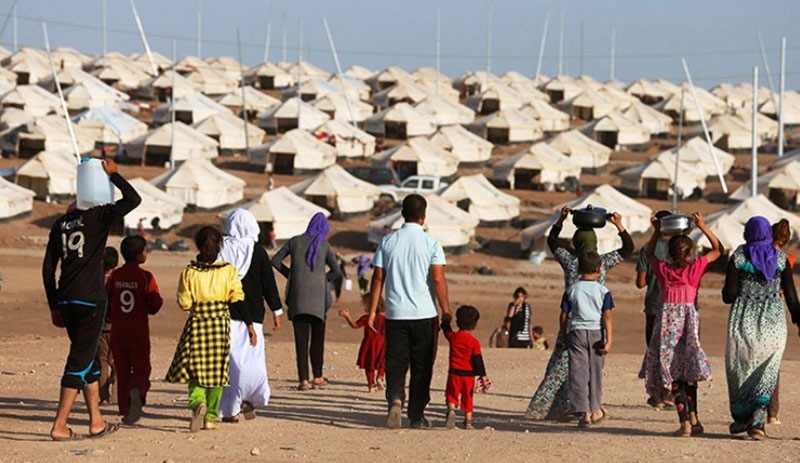 Turkey, home to nearly four million Syrians, does not grant them legal refugee status but rather a “temporary protection” regulated by a bill in 2013, to identify the legal status of Syrians in the country. The bill’s second article states that temporary protection can be “provided to foreigners in cases when there is a large influx into Turkey and where they cannot return back to the country they were forced to leave,” defining a particular legal status for the Syrian people fleeing from their war-torn country.